Have a question? Click here to email it to me, Or text me at 510-523-0707. May 29, 2015 What does Alameda's price profile look like for 1,000 sf to 1,800 sf det. SFRs over the past 10 year period? Click here to find out. May 29, 2015 In which cities across the East Bay can one buy a 4+ bedroom det. SFR in the price range of $500,000 to $600,000. Click here to find out. 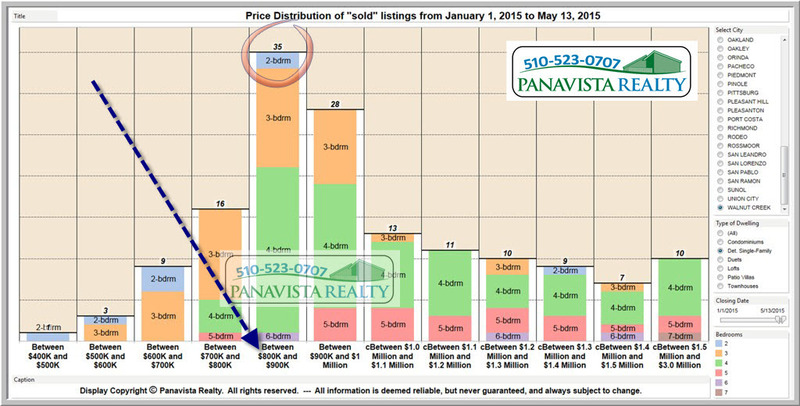 May 29, 2015 What has been the price distribution of 3-bedroom homes in Alameda since Mar 1, 2015? Click here to find out. May 25, 2015 What percentage of transactions have closed above the asking price over the past 30 days? Click here to see the green bar for each city. 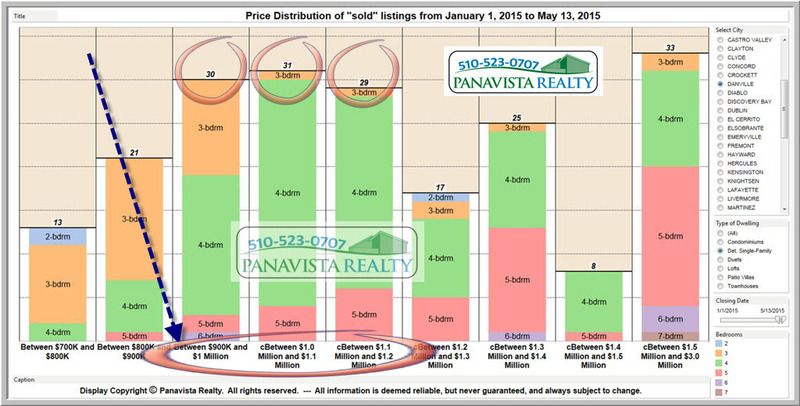 May 25, 2015 What does the Price Distribution (by # of bdrms) look like in Alameda's East End over the past 3 months? Click here to find out. May 25, 2015 How does the current supply of 4-bdrm det. SFR across the East Bay compare with past 1-week demand for these homes? Click here to find out. May 17, 2015 What is the price distribution of det. SFR in the Alameda's East End since the start of 2015? Click here to find out. 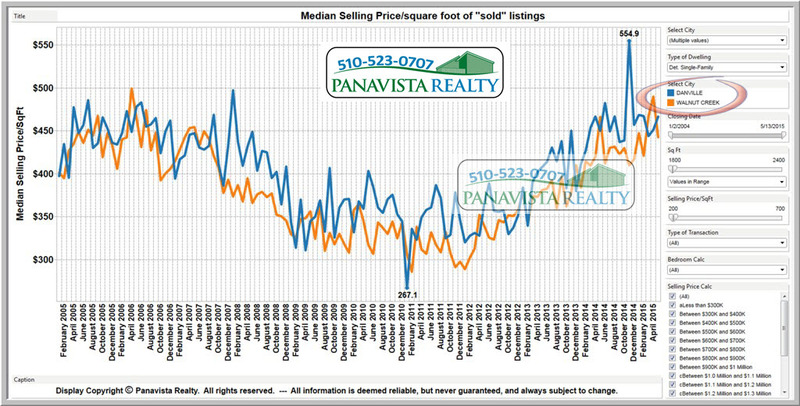 May 13, 2015 How do prices compare in Walnut Creek and Danville for det SFR in the 1,800 sf to 2,400 sf size range? Click here to find out. May 13, 2015 What is Danville's sweet spot 2015 year-to-date? Click here to find out. 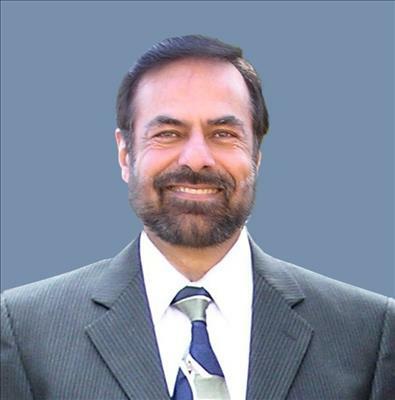 May 13, 2015 And Walnut Creek's sweet spot 2015 year-to date? Click here to find out. May 3, 2015 For an overview of the Alameda market for detached single-family homes, click here.